We will now put everything we have discussed together and look at all of the aerodynamic forces involved with a rotating blade around a shaft. This is set out in the figure below. We will firstly consider the position of the airflow. It is the relative airflow which sets the angle of attack, which is in turn determined by the horizontal (as a result of rotor rotation) and vertical airspeeds, with the latter being the result of induced flow. 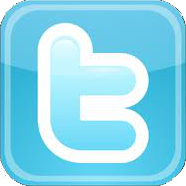 Secondly, we will look at the forces which play a role. 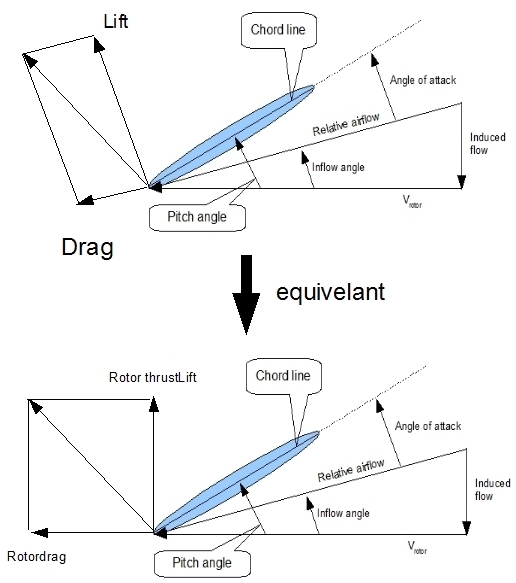 These are the two components of the airfoil's reaction force: lift and drag. We must now take an important step forwards in our line of reasoning if we are to take into account both the mechanical rotation around the shaft, and the torque that must be provided by the engine to power the rotorsystem. Another force we are interested in is the rotor's lift in the vertical direction (upwards). Formulated in another way, we are now interested in the horizontal and vertical force components which work on the rotating rotor, relative to the plane of rotation. This can easily be done by breaking the reaction force down into the desired components, instead of into the aerodynamic lift and drag elements. The two forces we are interested in are rotor thrust and rotor drag. These are defined as the force components orthogonal to the rotordisc (that is, 'straight up') and the force components parallel to the rotordisc. Rotor thrust defines the amount of vertical thrust (opposing the weigth of the helicopter). Rotor drag defines the amount of torque that the engine must provide to keep the system rotating. Note that the way we resolve the reaction force into its components is arbitrary from a mathematical point of view, and the way that we have chosen to do so is for engineering purposes (rotor thrust and rotor drag) instead of as a way to explain aerodynamic behaviour (lift and drag).